1st Test starts January 5th. India have a strong team. This is India's best chance to win against SA in SA. Most of guys have toured there before so surprise factor is not there. Also, Indian team seems more serious than earlier teams about winning. Will be a cracker of a series. Though I hope to be proved to be wrong , chances of India winning seem to be grim . The South Africans have a strong team and our boys will take time to adjust to the pacy wickets. But the time they adjust, the series will be over . So, the humiliation in Champion’s trophy is all forgotten? What good is winning or losing this series. Or the cricket memories too seem to be fickle. Champions trophy had a fixed final. Hopefully this series is not . I was thinking that he retired already. Looks like they are not taking any risk for 1st test. Every game is a new game. We cannot stop following just because we lost a game. Willow TV pe bhi tow aayega.. Live as well highlights.. plan to DVR..
That was not just a game. Celebrating other so called successes gives Cricketers confidence that they can get away after such Humiliating defeats. You could learn from some Pak fans who were waiting with eggs and tomatoes after defeat in Bangalore in 1996 WC. The flight had to be diverted from Karachi to Lahore. sgars bro, I think you are being too harsh. We had been consistently beating Pakistan in majority of ICC tournaments. They broke the jinx after a long time and although it was disappointing for us India fans, we need to take it in our stride. 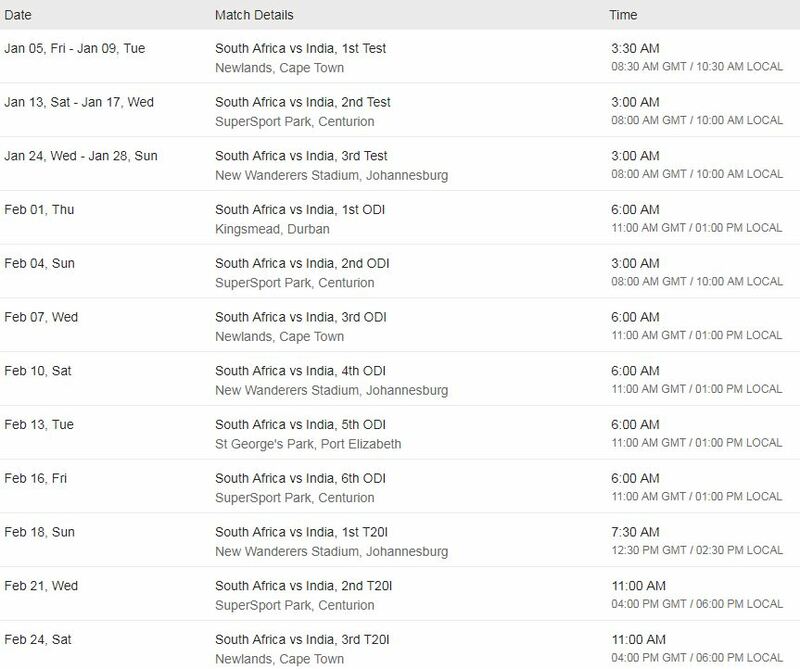 I am very optimistic about our chances in SA.. We have a good batting lineup a decent bowling lineup (after a long time) which we can boast about. All in all a very balanced team. I have free live link too almost as good as paid service. Have been casting all free stuff to my 65 inch hdtv. Last edited by sarv_shaktimaan; January 3rd, 2018 at 06:25 PM. Faf du plessis ups the rhetoric saying they have a score to settle.